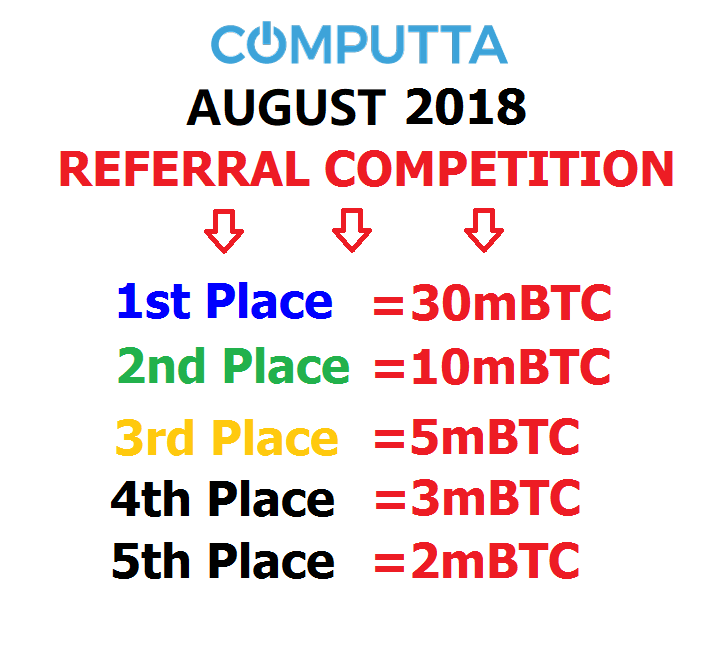 August 6, 2018 we started our new Referral Contest – Winner Gets 30mBTC (approx US$210!)! smd3******.ru with 631 referrals gets the First Place! gregc113******.com with 350 referrals – Second Place! akeelow******.com with 195 referrals – Third Place! jperina97******.fr with 161 referrals – Fourth Place! sahil.sahilthegr******.com with 115 referrals – Fifth Place! ONLY referrals who actually download and install the app and earned the first minimum of 0.005mBTC ( USD $0.05) will be counted. If we catch you getting fake/bogus/paid referrals, we WILL freeze your account and BAN you from Computta, with all current balance and referrals forfeited. No negotiations! Start sharing your ref link and go grab those prizes! If we again see someone who sends exceptional quality traffic and referral – we will award the Quality Prize this time again! Naturally, those who keep sending fake or dead referrals will be removed wiithout warning. By “dead” – we mean those referrals who do not even download and install the app. We do track everything! Just send quality traffic and you’ll be fine.